2003 Blazer LS 4 Door "Blazer JR"
So to kick this off I would like to say that the name of the vehicle or nickname is the Blazer Jr after my dads custom built K5 (Blazer Sr or Big Girl). 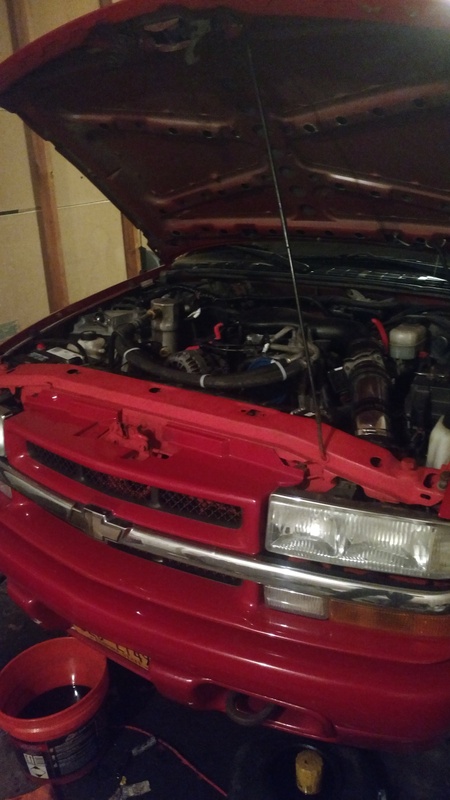 So My name is Tom, bought this fella a ways back for 600$ running however needed new brakes. Anywho Fast Forward to now without getting into too much historic detail here are two pictures ones under the hood and ones of a angled view of the front. Both were shortly after purchase. As time went on I replaced the Distributor, Fuel Pump and all four brake systems. Eventually I hit the point where I decided Its time for me to just start actually working on it for a goal instead of keeping it running. I decided to make it into a beater trail rig. So as we stand now. 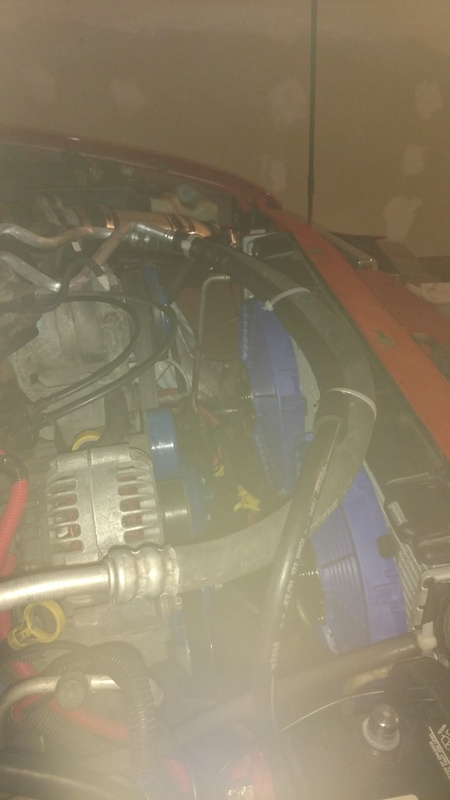 MSD Distributor, Fuel Pump (OE), New Zinc coated Brake Kit, 1" Tbar lift, New Radiator with DIY plastic and tube brackets + twin 12" electric fans + 14" Electric fan, Rebuilt 4.3L running V8 350 pistons 12cc dish (other then that aftermarket parts kit for a 4.3 rebuild), Specter Cold Air Intake. 3" Exhaust straight through Cat and Magnaflow Glass Pack, Removed the underside spare tire system, Universal Uhaul Hitch, reran every vacuum line, Did a Pioneer AVH-x2800 deck to 4 Renegade 6.5" Door Speakers, a JL Audio 700/5 amp and a 10w3v3 Subwoofer. Currently Im fabricating Skid trays and getting materials together for a home made bull bar. On standby (Due to no time to put it in) is my transmission rebuild kit (the stock 4l60E started going out inability to shift etc) Delux Corvette Servo Kit. Pump rotor guide 13 vane, Pump Rotor 13 Vane, High Energy friction clutch module, Pump Vane, 3-4 Zpack clutch System, a sun gear reaction shell, 2 5 pinion planets Front and rear, Transgo HD2 Shift Kit, a TMBX 4l60E ls torque converter 30 spline. Soon to purchase are: 2" Suspension lift and spring assisted front and rear shocks, 31" Goodyear Wrangler Authority Tires. I see you have the front tow hooks on your ride.Did the hooks come from the factory..Or did you install them your self?I want to install some hooks on my blazer.Also how`s the cold air hook up working for you?Nice ride buddy..
As far as I know it did come factory, I'm actually gonna coat mine black tomorrow more or less for rust purposes. The cold air intake is a nice improvement over stock. However I had to modify the shield for it as the shield that came with the spectre kit did not fit as intended. 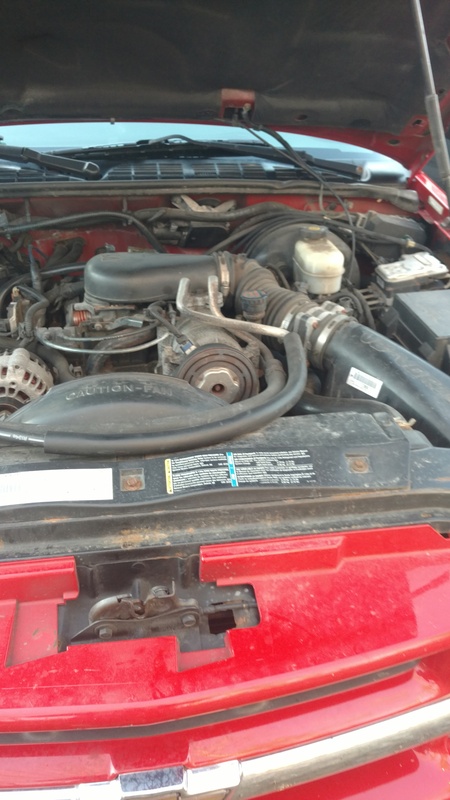 Other then that the plastic is alittle flimsy along the seems above the throttle body but spectre was really good about replacing mine when it cracked. Haven't had it cracked since (14 months). Thanks for the info buddy.But one more thing..This pertains the rear axel bump stops.I want to install some rear axel bumpstops.But I can`t measure mine because their completely gone.When you get a chance can you measure yours for me?I just want the length of the stops itself.Idon`t wanna go back to the cheap rubber oem`s either.i`m looking at the energy suspension bump stops that will at last rubber anyday.I had one guy help me out already.That was it.I think his is 4x4 it maybe different. Thanks for your time! If you ever have any questions..Don`t hesitate to contact me! Ill drop a post with measurements tomorrow, I am hitting up my shop in the morning since I got work off for a few days. Any other info or measurements needed? And thanks will ask If I run into anything! No that`s it my friend.Thanks for your time! Holding dish +actual rubber stops 5" +- and just rubber is 4 1/4" +- in height. 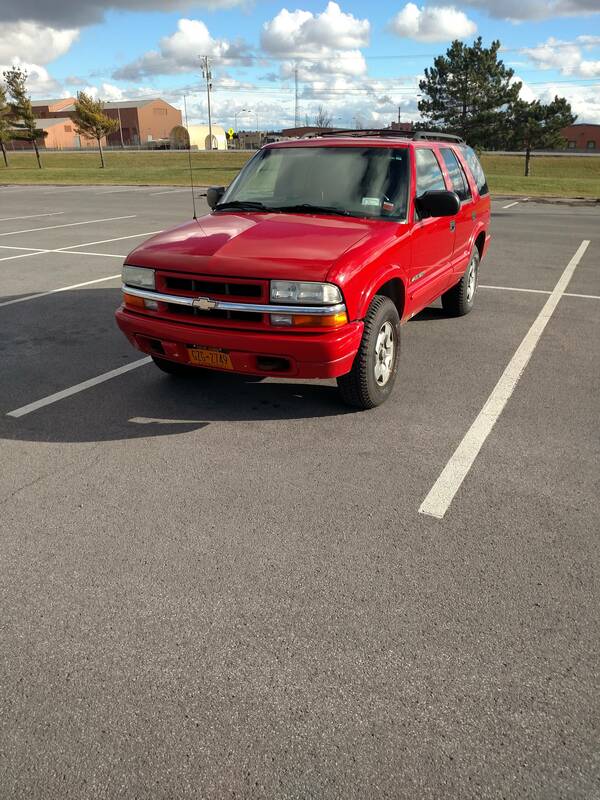 Quick Reply: 2003 Blazer LS 4 Door "Blazer JR"